I've create and use all of those devices in my work flow to make my performances more realistic and to bring them closer to the main idea who i imagine. It's very helpful to be able to create your own tools in order to reach anything you imagin to do. The Saxelectro's Tricky Chimes Ableton Live Instrument i've made by a sample of the Ab 4 Tubular Bell that i've recorded from the Athens Municipal Symphonic Orchestra's Chimes Instrument, at the location of their Rehersal Hall. The sample has the noise of the place and the noise of the whole instrument because i've recorded by Close Mic Technique. Doesn't matter because i want the reality of that sound. 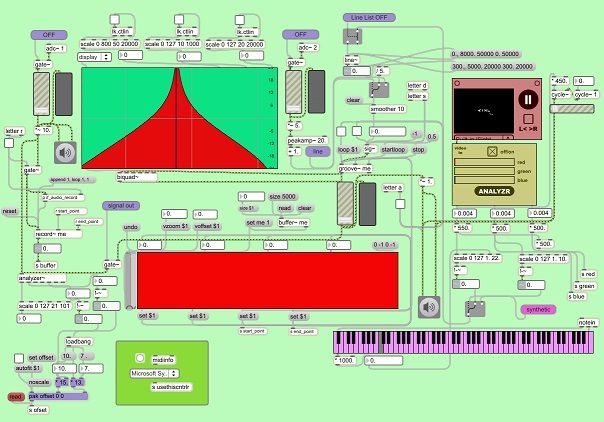 I've build the instrument in Ableton's Sampler and it's a chalenge for study about the possibilities of the software. GAMETRACK CONTROLLER M4L UTILITY. AS SMART AS SIMPLY. The Sax Colors Remote M4L device takes the R.G.B. analysis numbers from the main Sax Colors Control﻿ device and map them in any parameter without any other Camera or Video Player in numerous instances within or out of﻿ Live. The Sax Colors Uni Control M4L device takes the R.G.B. analysis numbers from any ﻿ other Vizzie Grabbr or Playr device and map them in any parameter without any other Camera or Video Player in numerous instances within or out of Live. The Sax Camera Control Remote M4L device takes the X Y tracking analysis numbers from the main Sax Camera Control﻿ device or from any ﻿ other Vizzie Grabbr or Playr device﻿ and map them in any parameter without any other camera in numerous instances within or out of Live. The Sax Video Mapping M4L device takes video stream from anyware within or out of Live and changes the dimensions and the shape of image in order to map this everywhere you like to project it. The Sax Blue 1 2 M4L device is a Bluetooth observer and makes the connection between the sensor and the software. It's constructed to achieve communication for two separate sensors with its all functions ( Accelerator﻿ X Y Z, Triggering). Also gives information about Battery power and monitors some of the main functions of each sensor. The Sax Simple Buffer Sync﻿ M4L device is an audio recorder/player with auto rec function (rec only when hear sound) and gives the possibility to Looping, Speedlooping, Speedloop tuning and Sample playing. 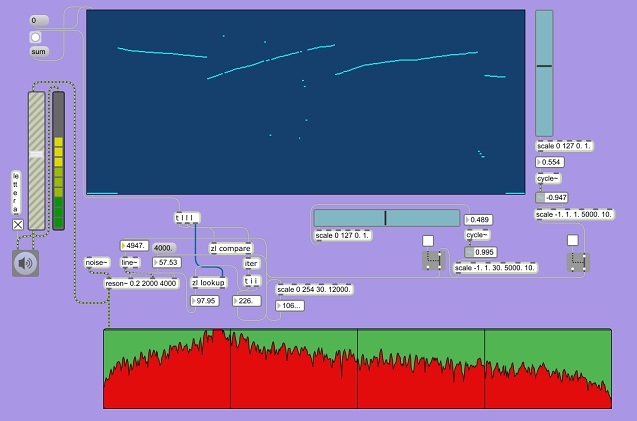 The player can follows the Ableton's transport. The Sax Loop Cont. Rec﻿ M4L device is an audio looper with auto rec function (rec only when hear sound) and gives the possibility to Continuous Looping and to choose﻿ loop points in continuous variation. Also the plugin gives a metronome for rythmic reference but don't follows the Ableton's transport. The Sax Glitchy Buffer﻿﻿﻿ M4L device is an audio recorder/player with auto rec function (rec only when hear sound) and gives the possibility to Chopping, Stuttering, Looping, Speedlooping, Speedloop tuning and Sample playing. The plagin can follows the Ableton's transport. The Sax Midi Scale Midi﻿﻿ M4L device is a preset based midi sequencer who follows the Ableton's transport. ﻿ The Sax Midi Scale Midi Free﻿﻿ M4L device is a preset based midi sequencer with free time modulation. The Sax Scale Audio﻿ M4L device is a preset based sequencer with a sinusoidal modulated oscillator who follows the Ableton's transport. The Sax Scale Audio Free﻿ M4L device is a preset based sequencer with a sinusoidal modulated oscillator and free time modulation. The Sax Rand~﻿ M4L device is a sound fx generator with a random wave signal oscillator﻿ and 8 frequency bands to choose what want to hear. The Sax Smooth Rand~﻿ M4L device is a physical modeling based sound generator and sounds like Guitar. There is a random wave signal oscillator﻿ a built in delay fx and an ADSR envelope who changes very dramatically the main signal. The Sax Smooth Noise~﻿ M4L device is a physical modeling based sound generator and sounds like Citar. There is a noise signal oscillator a built in delay fx﻿ and an ADSR envelope who changes very dramatically the main signal. The Sax Simple Rct~﻿ M4L device is a sound fx generator with rectangular (pulse) signal modulated oscillator﻿. The Sax Simple Tri~﻿ M4L device is a sound fx generator with triangular signal modulted oscillator﻿. The Sax Simple Sw~﻿ M4L device is a sound fx generator with sawtooth signal modulated oscillator﻿. The Sax Simple Cycle~﻿ M4L device is a sound fx generator with sinusoidal signal modulated oscillator﻿. The Sax Midi Uni Player M4L device is a universal midi player in order to follow the parameters from other devices or the movements from sensors who are located on my saxophone or whatever, and transform them in music within or out of Live. The Sax Scenes M4L device is a scene trigger for Ableton's Session View and follows the parameters from other devices or the triggers from sensors who are located on my saxophone or whatever, in order to trigger the Ableton's Scenes whenever I want in a live performance's flow from within or out of Live.